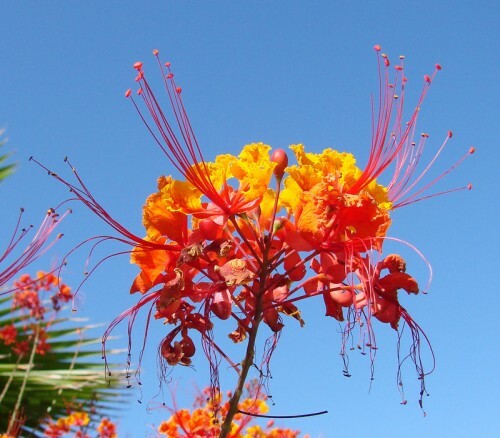 Caesalpinia pulcherrima-Desert Bird of Paradise-Also called Poinciana, Peacock flower, Mexican Bird of Paradise and Pride of Barbados. It can grow to 10 feet tall and is easily pruned to shape and size. Flowers have striking orange, red and yellow petals. It is found throughout tropical and sub-tropical America. It is used to attract hummingbirds. The seeds and other parts of the plant are poisonous if eaten. It thrives in zones 8 through 11. Mulch roots to protect through frosts. If frost causes damage prune back and it will come back next year.